Over the weekend, New York Ranger Sean Avery somewhat reverted to his old ways, when he “tapped” Boston Goalie Tim Thomas in the head with his stick during a break in play. Now don’t get me wrong… I’m not one of those people that thinks that Sean Avery should be hung from the rafters by his toe nails (these people are out there though). 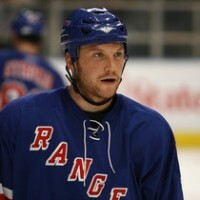 I actually think this was pretty funny, and pretty typical Sean Avery. He riled Tim Thomas up something major, and there was every bit the possibility that Thomas would be enough off of his game because of the incident, that the Rangers could have won the game. With the 2009 NHL Trade Deadline still very close in the rear-view mirror… let’s take a second and make some closing thoughts regarding some of the significant trades that teams made leading up to the deadline. I already discussed a couple of moves that had occurred early in the day March 4th, but with a flurry of deals made right before the deadline… we’ll revisit the issue a bit. Analysis: This is a great example of a team that is rebuilding and makes trades to develop their team for the future. Phoenix did very well to get pretty good returns for veterans that they were running out of use for. Jokinen is expendable because C Peter Mueller and C Kyle Turris are ready for more playing time. Morris is an unrestricted free agent this summer and would likely be leaving Phoenix at that time anyways. The acquisition of Prust from Calgary made Carcillo expendable. 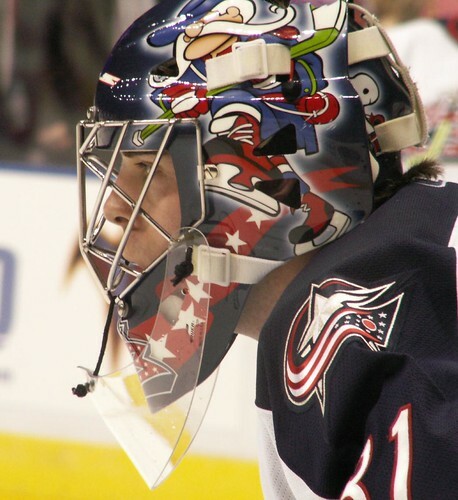 Finally, G Josh Tordjman has been stellar in the AHL this year and is ready to become Ilya Bryzgalov’s full time backup next season… this made Mikael Tellqvist somewhat expendable (especially since he – like Morris – is an unrestricted free agent this summer). So basically, Phoenix lost very few pieces of their ideal puzzle, but they gained a ton of really good picks and really fast forwards to make them one of the quicker, and potentially more dynamic teams in the league. Rating: A … The Coyotes did exactly what they needed/wanted to do in their position. Incoming: D Derek Morris (from Phoenix) – RW Nik Antropov (from Toronto). Analysis: In addition to bringing back W Sean Avery via waivers, the Rangers have added two decent rental players (both Antropov and Morris are unrestricted free agents at the end of this season). These moves will not put them over the top in my opinion though, as they didn’t get a physical defender or a crashing forward. Antropov (pictured above) is a big guy, but he plays most effectively on the fringe by the boards. The Rangers already have players who play by the boards. They needed a net presence. Morris is also a good defender, but he isn’t as physical as some of the other (probably cheaper) defensemen available, like Steve Montador for instance. A physical presence on the back end is another thing the Rangers desperately needed. Mark my words, it will quickly become very evident in the rough/physical Eastern Conference playoff race that the Rangers just aren’t physical enough. In the process, they’ve given up three decent prospects (Dawes will probably be missed the most because of his speed and work ethic) and two draft picks in this year’s draft. The Rangers are somewhat moving backwards in my opinion. It’s understandable that they felt they had to do something at the trade deadline (they are slipping in the standings as we speak), but sometimes making no moves is the best thing you can do for your team. Rating: C- … The Rangers didn’t really help themselves for this year’s playoffs, and they traded young depth, and draft picks that they’ll need to flesh out their team in the future (with all the massive contracts they have eating up cap space). Analysis: A few days prior to the trade deadline, the Penguins brought in W Chris Kunitz and traded away D Ryan Whitney. At the trade deadline, they pick up a gritty veteran forward in Guerin for fairly cheap. Guerin is a UFA at the end of this season, so he is likely just a rental… but he’s a good acquisition to a forward core that heavily lacks a physical presence and veteran leadership. Miroslav Satan made it through waivers and per NHL rules will not be able to participate in the NHL playoffs this year (players must be listed on the team’s roster as the trade deadline passes in order for them to participate in the playoffs). Waiving Satan was a necessary move to free up cap space to bring in Billy Guerin. Satan was an experiment that didn’t seem to work out as Pittsburgh would have hoped, and being an unrestricted free agent this summer. Making it through waivers suggests that not many teams will be kicking down doors to acquire him this off-season, so Satan could very well head back to play in Europe. Rating: B+ … Gaining grit and leadership up front is crucial to this still-young team’s chances of making it past the first round of the playoffs (or making it into the playoffs to start with). I still don’t agree with trading away Ryan Whitney, but at least they didn’t repeat last year’s mistake of paying to much for a rental player. A conditional fifth-round pick is a very reasonable price for a forward that still has enough skill to play in the top six of the majority of NHL teams. Three-Way Deal: Los Angeles trades W/C Patrick O’Sullivan, 2009 second-round pick to Carolina for W Justin Williams. Carolina then trades W/C Patrick O’Sullivan, a different 2009 second-round pick, and a 2009 fifth-round pick to Edmonton for W Erik Cole (pictured left). Analysis: In addition to acquiring Ales Kotalik from Buffalo in another trade, Edmonton did well to add young players oozing with potential, by only giving up a wing that didn’t work out like they thought he would (Cole). Carolina gets their power forward back that they realize now (hindsight is 20-20) was an integral part of their past successes. LA sheds some youth and adds a great (albeit injury prone) winger that’s pretty much done progressing and ready to help their team right away (when healthy). Rating(s): Edmonton… C+ … This team seems to be in a perpetual rebuild… the deal isn’t bad (especially considering that Cole was fairly expensive and didn’t ever really fit in with the Oil). Edmonton’s forward core is possibly the youngest in the league. Adding O’Sullivan is a good move for their future, but how much longer are they going to “develop players?” At some point, the young players they continue to bring in (via trade and via draft) have to start winning games consistently. Los Angeles… B+ … LA gets a really good player that fans and teammates will love. They give up O’Sullivan who (while young and very good skill-wise) seemed to develop some attitude problems recently. O’Sullivan was costing the Kings nearly as much as Williams will. LA also has a great core of young players, but they needed to bring in an older forward to help guide the younger players. Good move by the Kings. Especially if Williams can stay healthy. Carolina… B … They get their guy back. They do in turn lose another forward that was integral to their Stanley Cup run. It remains to be seen if Carolina is better with Cole and without Williams than they were with Williams and without Cole. Cole nearly had a career ending neck/back injury a couple years back, so he is by no means a sure thing when it comes to injuries… but the fact remains that Williams hasn’t played much the past couple of seasons, so any player that’s on the ice is an upgrade from that situation I suppose.